Camping Domaine de La Ville Huchet är en camping i Saint-Malo, Ille-et-Vilaine. Campingen har platser platser med lite skugga. Det finns möjlighet att hyra husbilar, Enrumslägenheter och bungalows. På campingen finns en lekplats och ett sportområde. Campingen förfogar över en simanläggning, en utomhusbassäng, ett uppvärmt inomhusbad och ett knattebad. Det finns också en vattenrutschbana. Denna inspektör gör varje år ett besök på Camping Domaine de La Ville Huchet och inspekterar campingen för ca 200 faciliteter och för andra förekommande punkter. Inspektören är en medarbetare från ACSI och arbetar inte för campingen. Lovely setting with the Chateau at the center of the site, which the wife had an idyllic number of hours painting a water color of. Beautiful pool and good pitches and facilities. Its only draw back is that it is too far away from St Malo to walk to, always a benefit with a motorhome. A great site for a stay in wonderful St.Malo. The toilets and showers are exceptionally good, some of the very best.very well cleaned and looked after . The park was In low season with only a few visitors, so p,entry of sites to chose. They are all very large pitches. The only point would be the public transport. It is NOT close by at less than 500 metres as is claimed. It is well in excess of a kilometre , part of which is on a busy road with no path. That aside, we would certainly recommend and return. The bus into the old walled city is cheap and frequent. An appointment is organized next week with the town of Saint Malo to see how it would be possible to have a bus line during the season for our customer. This site is excellent although we only go out of the main holiday season. For touring vans there is 6 amp on smaller pitches but larger pitches are available. The biggest problem is that there is nowhere to empty cassette toilets. The wasing facilities are excellent and we were amazed that this facility is not available. We have written to ACSI about as they inspect the site but they have not responded. We have been there 3 years running and will definitely go back again. Vill du boka campingen Camping Domaine de La Ville Huchet eller få mera information? Det går bra med nedanstående uppgifter eller via campingens webbsida. 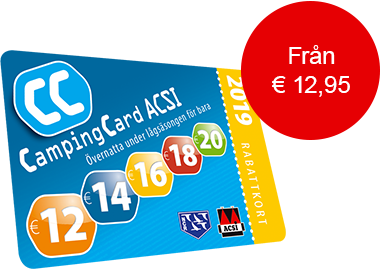 ACSI Eurocampings skickar din informationsförfrågan till "Camping Domaine de La Ville Huchet".